Last weekend in October. Two months until the end of the year. Two months until 2018. What did you do this weekend? 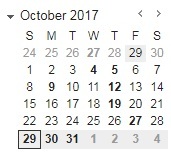 Wonder how you were going to make your October quota in two days? Wonder how you were going to bail out 2017 in the next two months? Wonder whether you were thinking big enough or safe enough for 2018? May I share a couple of recent stories? Have you been watching the news? My brother met Irma and Maria. My sister met Jose and Maria. My son's family were across the street from wildfires in Montana. Several of our clients have clients that were affected by the earthquakes in Mexico and one of our clients spent a week trying to help his relatives in Texas deal with Harvey and what the heck was Las Vegas all about? If I see the animals pairing off and lining up, I'm heading for higher ground.